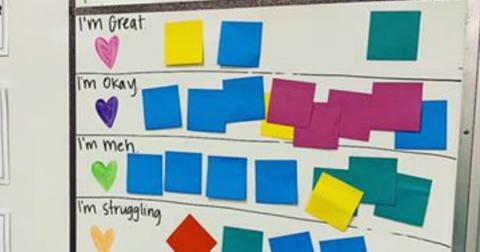 A teacher's gone viral for a very cool reason: she set up a board in her classroom that allows student to express how they're feeling. I grew up in a family where kids were expected to just shut up and do what their parents said. Which is why I loved school, for the most part, when I was a child. Sure, you were expected to sit down and generally keep quiet, but I had some amazing teachers who really knew what they were doing. What separated these teachers from the rest was the fact that they went out of their way to attune their teaching styles to my needs. Was I feeling OK that particular day? How was I doing with the source material? What were my thoughts and honest feelings about the day's lesson? That's probably why I'm loving this board Tara Mitchell Holman put up in her classroom. Holman created six different categories: "I'm great," "I'm okay," "I'm meh," "I'm struggling," "I'm having a tough time and wouldn't mind a check-in," and "I'm not doing great." 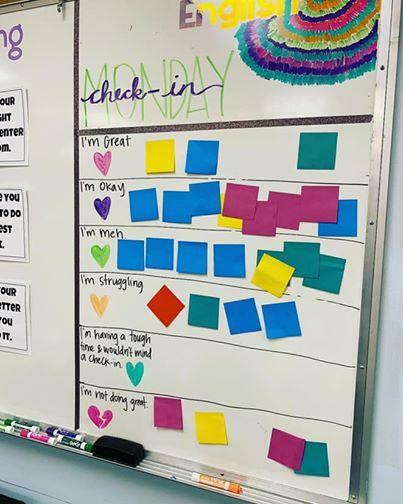 Every Monday Holman has a "weekly check-in day" where she asks students to write their name on the back of a sticky note and place it on the board in the category that most closely fits their current mental state. Then she takes the time each Monday to speak to each student one on one about how and why they're feeling the way they do. I wish my parents had fostered more aware of our emotions and talked about them openly growing up. I'd have known that, while feelings are real, they're ultimately the result of what I'm going after or not going after in my life, and I can guide them in a useful direction. That would be better than just letting them fester and affect other aspects of my life, which is unfortunately what happens to many of us, including young children. Research shows a growing number of youngsters are experiencing mental health issues. There are varying opinions about why. It could simply be that people are becoming better at expressing their mental health concerns than they were in the past. Others think it may have something to do with the constant exposure to information. They're the most "connected" generation that's ever existed. From social media, to news stations, different streaming/TV services, we're constantly exposed to strangers who are seemingly living their "best lives" on Instagram while we eat shredded cheese and binge watch The Office, it's easy to feel insecure. Tara's post has been shared over 179,000 times, with throngs of parents and educators praising the teacher's idea. Many hopeful teachers also expressed that they would want to do the same thing for their own classrooms, which is probably why the image was shared so many times. A lot of research and several articles extol initiatives like the one Tara has implemented in her classroom. By treating each student like an individual and understanding them, she's better able to determine the best way to relate the curriculum so students absorb it. Do you know any teachers who would benefit from a board like this?